Thinking about college, a career school, or graduate school but wondering how you’re going to pay for it? The first thing you should do is fill out the Free Application for Student Aid to see how much you might qualify for in grants, loans, or work-study funds. The free FAFSA application gives you access to vast sources of financial aid to help pay for school. But don’t stop there—along with filling out the FAFSA, you should also find and apply for many individual scholarships. Why are scholarships so great? Scholarships are free money – unlike loans, they don’t need to be repaid. And there are thousands of scholarships available: they’re offered by schools, employers, individuals, private companies, nonprofits, communities, religious groups, and professional and social organizations. Some offer just a small sum of money and some cover the entire cost of tuition. There are also many different types of scholarships. Some are merit-based, meaning they’re based on your grades, test scores, skills, or abilities (such as music, sports, arts, and other pursuits). Others are geared toward particular groups of people: you might be eligible for scholarships based on where you or your parents work, where you live, where you want to go to school, your race or ethnicity, your gender, your family’s military service history, or just about any other trait you can think of. How can I find scholarships to apply for? Ready to see what’s out there? 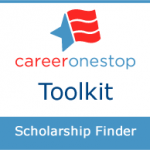 CareerOneStop has revamped its Scholarship Finder to make it even easier to identify scholarships that are likely to be the best fit for you. When you visit the Scholarship Finder, you’ll first see a list of more than 7,500 scholarships (along with grants, fellowships, and other financial aid award opportunities), arranged according to their application deadlines. You can narrow this list by entering a keyword for the type of award you’re looking for, or using the filters to see only awards that are geared toward a certain level of study, a location, a group or employer affiliation, or gender. 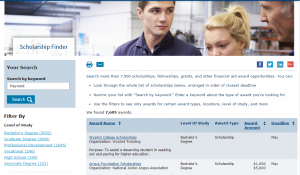 Visit the Scholarship Finder Help for suggestions on how to use the keyword search and filters. If you’re in high school, the summer between your junior and senior year is a great time to search for and start applying for scholarships. But you can apply anytime. Some deadlines are as early as a year before you plan to start school—but others have much shorter deadlines. On the Scholarship Finder, you can use the Deadline column to sort awards based on their deadline month. When do I get scholarship money? If you’re selected to receive a scholarship, you’ll hear from the sponsor about when and how you’ll receive the award money. Sometimes the money goes directly to the school you’ll be attending, and sometimes you’ll receive a check. Increase your chances of getting the most money for school by applying for as many relevant scholarships as you can!